I’ve been traveling more than usual this year, and some months, I’ve been gone as much as I’m home. Here's how I work extra hard to keep my weight stable when I travel. I’ve been traveling more than usual this year, and some months, I’ve been gone as much as I’m home. Since I’m one of those unfortunate people who gains weight from just sniffing high-calorie foods—and because I have less control over my meals, snacks, and daily exercise routine—I have to work extra hard at keeping my weight stable when I travel. I was recently commiserating with a nutritionist colleague, Katherine Brooking, MS, RD, about joining the Sisterhood of the Traveling "Expandable-Waistline" Pants, when she said, “It sounds like you’re using your travel schedule to derail your diet, and you give in to eating poorly on the road.” Then she explained that she often loses weight (skinny b*tch!) while on road trips. I've heard much of the same from other RD colleagues who plan ahead and have great strategies to keep in control of their food choices when traveling. Here are some tips from Brooking and other dietitians who have mastered traveling light. For short trips (two hours or less) avoid snacking and just have water or calorie-free beverages. 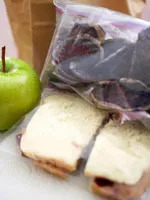 For 3-hour-plus trips, pack one piece of fruit or 1/4 to 1/2 cup dried fruit and a turkey and low-fat cheese or peanut butter and jelly sandwich on whole-wheat bread. This helps avoid airport or airline food or convenience store options. Take your body weight and divide that in half: That should be your ounces of water goal for the day. For example, a 130-pound woman would strive for 65 ounces of water. Have plenty of water and other calorie-free beverages on hand, in a mini cooler or in a large thermos or reusable plastic bottle. For other calorie-free options, try Crystal Light or Lipton Tea to Go packets. It’s calorie-free and can also divert your mind away from food. In a pinch, order a “skinny” latte from Starbucks. If you’re hungry and faced with fast food in the early morning, opt for the Starbucks oatmeal. At hotels, I tend to order grilled chicken or fish with dressing or sauces on the side. I'll also often special-order veggies sautéed lightly in olive oil or steamed, and a plain baked potato. I have a sweet tooth, so I find that a few Raisinets usually do the trick (and certainly, if you have just 1/2 the bag, much better than a heaping slice of cheesecake). Even if you have to get up early or walk at night, try to fit in some exercise. Leave extra time between planned activities so you can walk from place to place, if possible, rather than taking a cab or driving. While on airport layovers, walk the terminal as much as you can and avoid the people-mover escalators. Fill a baggie with your favorite fiber-rich cereal or single-serve instant oatmeal packets so breakfast is the same every day. All you need is skim milk, a bowl, and a spoon to have a healthy start to your day. Again, here's another way those baggies come in handy: Keep a few filled with a cereal, dried fruit, and nut mixture, or an ounce or two of nuts in your car. That way, you have just a little bit to nosh on (don't tear into more than one bag per car ride!) while you're out and about. It'll curb your hunger so you don’t overeat once you reach your destination or return home.